I don't know why I never posted this for the group. Here's a circle of fifths specifically for the ukulele you can print out and keep in your songwriters notebook. Should save you a lot of time and allow you to write in keys you never think about. Last edited by Gary Jugert; 01-17-2012 at 04:59 AM. Reason: I moved this image and fixed the Db/C# confusion. But what do all those black lines and red dots mean? How would one use this chart. TMI.......seen this before, just makes my head hurt.....sounds like "blah, blah, blah, blah" to my little brain.....and yes, I can read music. UWC; only those who have not been can rationalize not going. Don't freak out. 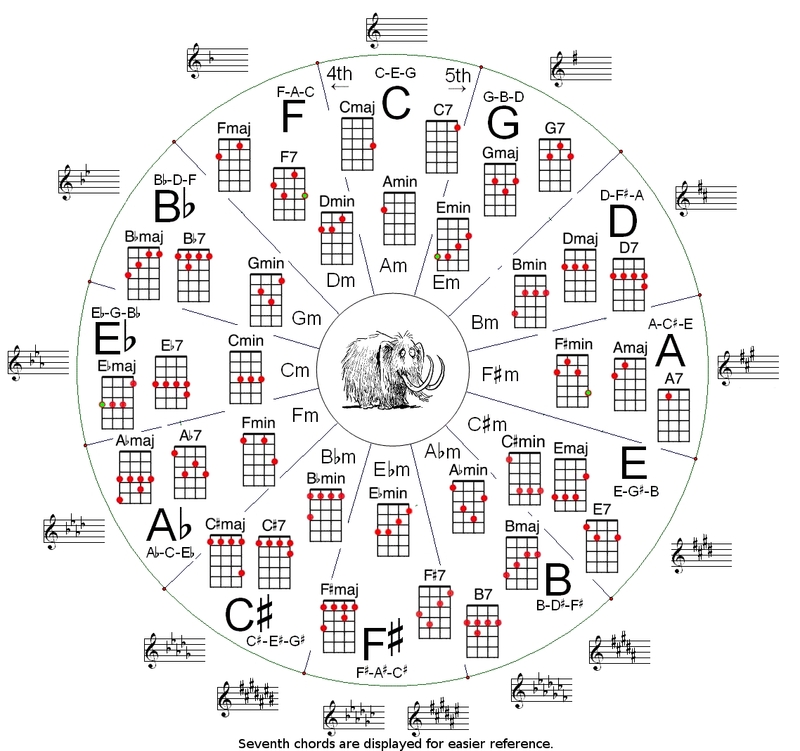 The circle of fifths puts (almost) everything a songwriter needs to know on one page ... so while it looks like a brain splitting scary thing, it's actually "everything you need to know about music theory, but really hoped you'd be able to avoid." If you're writing a song, you don't need to know every chord in the Ukulele Chord Book. You only need these basic chords and your lovely voice. I'm still trying to find time to make some videos, but here's the basics. If you want to write a song in the key of C ... you can use any of the chords that touch "C" on the circle of fifths (namely F, G, and Am). You'll also get away with using Dm and Em. The further you go away from your main key around the circle, the more difficulty you'll find in making your chords sound "right." Grab your favorite song by anybody and there's a pretty high chance that every chord in the song will fit on this chart in a little clump around the main key of the song. If the song you're hoping to write sounds better in Eb, then you just roll around on the circle of fifths and use the chords touching the Eb piece of the pie. Many ukulele songwriters don't use this chart (possibly because they haven't taken formal lessons) and this chart has the potential to speed up your songwriting and also to help you expand your songwriting tools. Yep, All about the I, IV, V.
Actually helps me a lot, as I played guitar for ages and I am only just beginning to be able to make my fingers form a guitar "C" shape and have my brain say "F"
Mctrmt has a nifty video about making a wheel thats pretty sweet too. Oh, her. I hear she only posts on Fridays now. It's demonic!! Don't look at it! If you play the notes in order five times around the circle counter-clockwise, you will invoke the Spirit of the Pineapple Sunday and it will trap you in it's soundhole for all eternity!! "I can't tell if it's an A# or a Bb..."
"If you hit the wrong note, we'll all be flat"
Why is that poor elephant/mammoth trapped in the middle? I want to rescue him. HEY MIM -> D I C K L E S ! PM me if I know you and we aren't Facebook friends!